Working as a milkman was often thankless, but those old enough to remember the days of milk delivery often look back with nostalgia on that period of time when life operated at a slower pace. Folks would begin the day by opening their doors to retrieve bottles of milk, fresh from the farm, just waiting to be enjoyed by adults and children alike. Maryland resident Judy Bach remembers hearing the clinking bottles early in the morning as the milkman arrived at her house and even recalls a certain jingle after all these years, “If you don’t own a cow, call Cloverland now, North 9222,” she said with a chuckle. 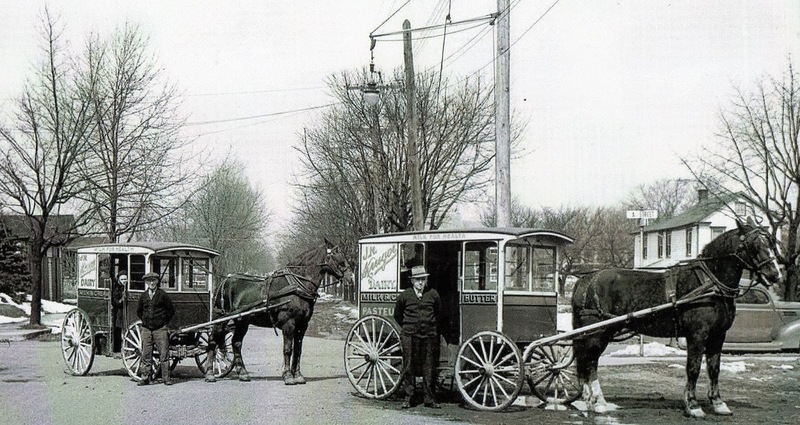 According to most accounts, milk delivery began in the 1800s, when milkmen traveled by wagon, with cans full of the product, which they ladled out with dippers into customer-provided containers. Carlisle resident Charles Kruger, now in his mid-80s, tells how milk not only nourished his family physically, but provided for them financially as well. “Sometime around 1916 or 1917, my mother made a deal with this farmer to bring his milk in and she would peddle it. Those days they used buckets, crocks, jars--whatever customers brought to hold the milk. Kids would pull the express wagon with the can of milk on it. My dad was a railroader and he got hurt, so he had to quit and do other things. During WWI, they conscripted the railroad guys to haul equipment to the seaports, so dad returned to the railroad. At that time, my mom sold milk off her wagon. When the war was over, all the railroad guys got their jobs back, so my dad was bumped. He said, ‘mother, how we gonna make a living?’ She said, ‘well, this milk business isn’t so bad,’ so dad bought a horse and wagon and started to peddle milk,” he said. Kruger said his father would visit a local farm after the twice-a-day milking. “He started to cool the milk in an ice bath and stirred it until it was cold. What he was doing was stopping the growth of bacteria because most people’s milk was sour in the morning as it curdled overnight,” he said, adding that his dad’s milk became popular because it would last several days. “They thought we were putting something in it,” he said with a laugh. Before homogenization, customers would have to shake the milk to distribute the cream evenly. Kids, in particular, used to enjoy the cream that would rise to the top. “In the winter, when the milk froze, it would pop up the cap and the first kid out the door would get the cream ball,” said Kruger. As milk delivery became increasingly popular, the milkmen of yore contended with problems unique to the profession. An article in the San Francisco Chronicle, dated September 6, 1902, said, “He comes and goes like a shadow in the early dawn, communicated with, if at all, by means of notes, which he has to strike a match to read.” It continues with tales of beleaguered milkmen who were vexed with a litany of issues. Inspectors would halt them on the street and subject their milk to a lactometer test, forcing those who failed to dump their product out on the streets, or into the marshes. Thieving competitors, who would run short on their own routes, might swipe a few bottles from another’s porch delivery. Other problems revolved around the milk bottles themselves--from the lazy customer who refused to wash them, to the careless ones who forgot to return them and the unscrupulous scofflaws who had other ideas for their use. Milkmen often returned from their routes short many a bottle. One reported catching a customer preserving fruits in his bottles and sharing a laugh with her about it, only to return later with helpers to recapture the stolen bottles. Needless to say, he wasn’t invited back. 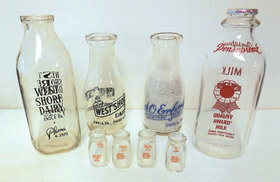 Many a milkman may have welcomed the advent of “returnable bottles,” which gave customers a financial incentive to “remember” to relinquish them. The onset of the war brought even further challenges to the milkmen. “They were trying to conserve fuel, so delivery was reduced to every other day,” said Kruger. “Our competitors found this out and used it against us, delivering on the off days, so instead of a family ordering four quarts from us, they’d order two from us and two from the other guy,” he said. Before insulated porch boxes were used, sunlight would oxidize milk left on the doorstep. Kruger tells the story of how a local glass company made an error on a large lot of amber bottles. “We got a heck of a deal on a bunch of them,” he said, adding that they just labeled over the problem. The dark protected the milk from the sunlight, providing his company with a competitive edge. “We marketed it as more wholesome,” said Kruger. As time passed, so did the need for the milkman. Refrigerators reduced the need for frequent deliveries and many families purchased second cars so any spouse could drive to the supermarket whenever the need arose. Soon dairies like Kruger’s began to merge in order to stay in business. The age of milk delivery reached its nadir near the 1970's, although some businesses continued the practice years later. Today milk delivery is more of a novelty, although a search on the internet proves that it’s still taking place. Here in Central Pennsylvania, a business called Mr. Milkman touts home delivery in Cumberland, Dauphin, York and surrounding counties. Does this prove that what’s old is new again and that there’s a modern market for the days of old? Only time will tell, but for now there will always be those who long for the good old days when the cream would always rise to the top. Your blog post reminds me of simpler days. I'm not old enough to remember horse drawn delivery, but our milkman drove a truck and wore a uniform.